The American Geriatrics Society (AGS) will this May honor two of the field's most seasoned clinician-educators with one of the Society's highest accolades. John R. Buton, MD, AGSF–Professor of Medicine and Co-Director of the Johns Hopkins Geriatrics Workforce Enhancement Program (GWEP) in Maryland–and George W. Drach, MD, AGSF–Emeritus Professor of Surgery at the Perelman School of Medicine at the University of Pennsylvania and the College of Medicine at the University of Arizona–will be recognized for decades of commitment to community service and geriatrics education when they receive the David H. Solomon Public Service Award at the AGS 2018 Annual Scientific Meeting (#AGS18), held May 3-5 in Orlando, Fla.
"Dr. Burton and Dr. Drach exemplify two pillars of geriatrics: Our commitment to educate more of the experts we all will need as we age and our promise to ensure that all our doctors, nurses, social workers, pharmacists, and other health professionals understand what makes our care unique as we age," notes Ellen Flaherty, PhD, APRN, AGSF, AGS Board Chair. With research interests in models of care, geriatric syndromes, and best practices for engaging more emerging health professionals in geriatrics expertise, Dr. Burton has led geriatrics education at Johns Hopkins for more than three decades. Having worked as Clinical Director and Director of the Division of Geriatric Medicine and Gerontology, Dr. Burton later became involved in community education programs like the Geriatrics Workforce Enhancement Program (GWEP), which is funded by the Health Resources & Services Administration (HRSA). Across Dr. Burton's tenure and under his leadership, Johns Hopkins has launched a host of clinical programs benefitting older adults, including Johns Hopkins Home-Based Medicine, Hospital at Home, the Program for All-inclusive Care of the Elderly (PACE), and the Orthopedic-Geriatric Medicine Hip Fracture Service. And while Dr. Burton has helped to accelerate the depth and breadth of geriatrics expertise at Johns Hopkins, he is also known for his role co-directing (with Dr. Solomon, the namesake for his 2018 award) for more than a decade the AGS's Geriatrics-for-Specialists Initiative (GSI), a program funded for nearly 25 years by The John A. Hartford Foundation. The GSI has helped develop educational programs and researcher career development awards, and has worked with specialty organizations to encourage geriatrics expertise for all physicians. Dr. Burton co-edited one of the field's first textbooks, Geriatrics for Specialists, describing the emerging knowledge base of geriatrics within the surgical and medical specialties. Much of this new knowledge was developed by scholars associated with the GSI. A passion for ensuring all health professionals are skilled in caring for older adults has also driven the work of Dr. Drach. Inspired by his own parents struggles with geriatric care while in their 80s, Dr. George Drach worked to spread the greater awareness necessary in geriatric surgery. A passion for ensuring that all branches of surgery are specifically trained in caring for older adults has driven his work since 1995. He specialized in urology after learning about it in the Navy in 1964, and later as Chief of Urology at the University of Arizona focused initially on the treatment of kidney stones. Chosen to lead the U.S. Food and Drug Administration trials on the lithotripter, which would transform kidney stone treatment, he became known as the "Father of American Lithotripsy." He was later also selected as President of the American Board of Urology. There he saw the impact of specialized courses, residency educational requirements, and Board examinations in preparing doctors, and later transferred this strategy to encourage specialized care for older people in all surgical specialties. Dr. Drach began working with the American Urological Association as a representative to the AGS and its GSI in 1995. He wished to create prototype residency education and afterward provide continuing medical education in geriatric care. In addition to hundreds of journal articles, book chapters, and books he has authored, Dr. Drach also recently co-edited a Primer of Geriatric Urology, now in its second edition. He has been Visiting Professor to many universities to encourage increased awareness among surgeons regarding needs, protocols, techniques, and optimal outcomes for older adults. He continues to parlay his experience and influence to insure that innovative best practices can be tailored to meet the needs of us all as we age. Established by the AGS in 2002, the David H. Solomon Public Service Award celebrates the legacy of David H. Solomon, MD, AGSF, a renowned geriatrician committed to community service and advancing knowledge about the care of older individuals. It is one of several honors conferred by the AGS at its Annual Scientific Meeting. The 2018 award recipients include more than 15 healthcare leaders representing the depth and breadth of disciplines championing care for older adults. For more information, visit Meeting.AmericanGeriatrics.org. Founded in 1942, the American Geriatrics Society (AGS) is a nationwide, not-for-profit society of geriatrics healthcare professionals that has–for more than 75 years–worked to improve the health, independence, and quality of life of older people. Its nearly 6,000 members include geriatricians, geriatric nurses, social workers, family practitioners, physician assistants, pharmacists, and internists. The Society provides leadership to healthcare professionals, policymakers, and the public by implementing and advocating for programs in patient care, research, professional and public education, and public policy. For more information, visit AmericanGeriatrics.org. The AGS created the David H. Solomon Public Service Award in 2002 to honor David H. Solomon, MD, AGSF, for his commitment to community service and the advancement of knowledge in caring for older adults. Dr. Solomon was the founding Director of the Center on Aging at the David Geffen School of Medicine at the University of California, Los Angeles. He will forever be remembered for his excellence in research, teaching, patient care, and administration. 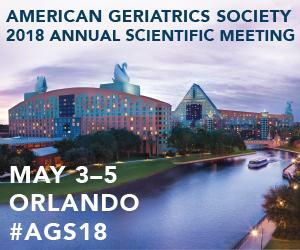 The AGS Annual Scientific Meeting is the premier educational event in geriatrics, providing the latest information on clinical care, research on aging, and innovative models of care delivery. More than 2,500 nurses, pharmacists, physicians, physician assistants, social workers, long-term care and managed care providers, healthcare administrators, and others will convene May 3-5, 2018 (pre-conference program on May 2), at the Walt Disney World® Swan & Dolphin Resort in Orlando, Fla., to advance geriatrics knowledge and skills through state-of-the-art educational sessions and research presentations. For more information, visit Meeting.AmericanGeriatrics.org.